Toshiba Tec is usually ahead of the crowd when it comes to the latest innovations in the world of barcode label printers but it really has pulled out all of the stops with its latest model – The Toshiba Tec B-EX4T2. It is already getting rave reviews as a commercial tool that is not only well-priced in the market place but also can help cut secondary business costs and effect in house processes. The first thing that strikes you about the B-EX4T2 is its low cost. A great advantage for any manufacturing or retail manager this barcode label printer can smoothly upgrade from most legacy printer hardware. Amazingly low running costs. The Toshibe Tec B-EX4T2 has the lowest running costs compared with any other barcode label printer on the market today. Easy Transition from old label and ribbon stock. Flat-head technology, combined with left justified media and the use of inside and outside wound ribbons allow for easy transition with further savings possible on running costs when replacing printing estates that are ageing and expensive to operate. 600m ribbon offered as standard which is 33% longer than other industrial printer ribbons currently available – as well as the option of an 800m ribbon – downtime and associated costs are also cut to a minimum. Toshiba TEC’s use of Z-Mode emulation ensures that the B-EX4T2 can replace competitor products quickly and seamlessly, integrating into legacy software systems without the need for huge capital investment in expensive upgrades. 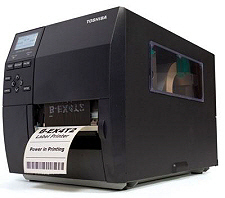 At Tanto Labels we supply everything to do with barcode labels and barcode label printers. To view all our products and services view our menu on the left or visit our main site.